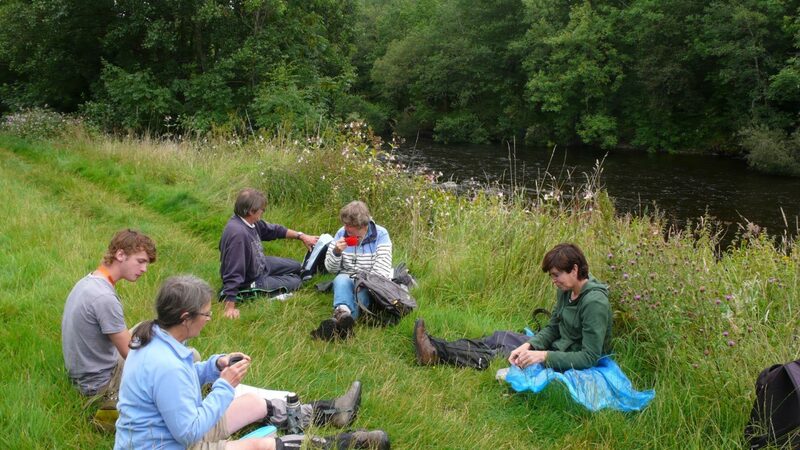 Given the very wet forecast for the previous Sunday we moved the meeting a week and had a very pleasant and dry day to botanise in and around Thornhill (NX8795). Thornhill is a smart small town with a long association with the Buccleuch Family at Drumlanrig further up the valley. We parked in the middle of town and walked out towards the river. We soon started to find plants established on walls, pavement cracks and in front of houses. This provoked a debate about where recording stops and gardens start. BSBI guidance is to record anything that is outside the garden boundary including the wall where plants have obviously escaped (and not been deliberately placed) and also to record anything wild or naturalised within gardens, parks or cemeteries. 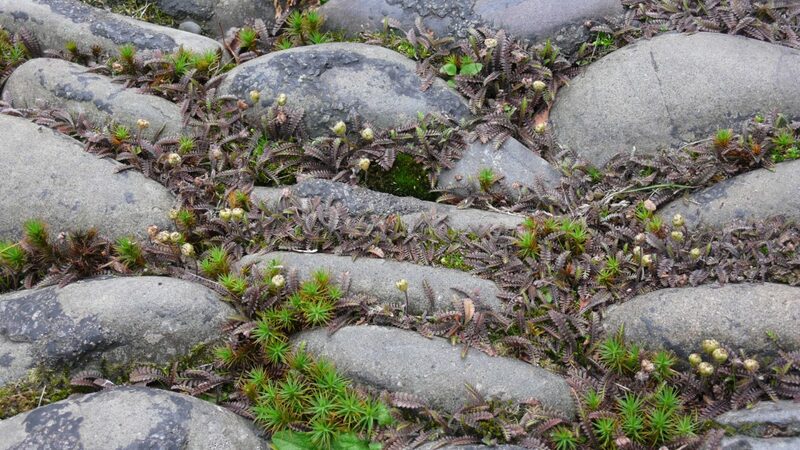 We found one particularly interesting patch of pavement/parking that had established plants of Matted Pratia Pratia pedunculata (id by Drew who has it in his lawn), Leptinella Cotula squalida – probably the variety Platts Black and Colorado Stonecrop Sedum spathulifolium. Walking out of town we followed the road down to the river. The edges of this lane turned out to be good for weedy species typical of arable ground. So we found Common Orache Atriplex patula, Fat Hen Chenodpodium album and Sun Spurge Euphorbia helioscopica. In the woods down the lane there were some established throw outs from gardens like Greater Celandine Chelidonium majus, Lungwort Pulmonaria officinalis and Solomans Seal Polygonatum x hybridum. At the bottom of the lane was a patch of recently disturbed verge where a telecoms box had been installed. This had some very interesting annuals including a first record for NX89 and only the 7th localised record for Dumfriesshire of Lesser Swine-cress Lepidium didymum. 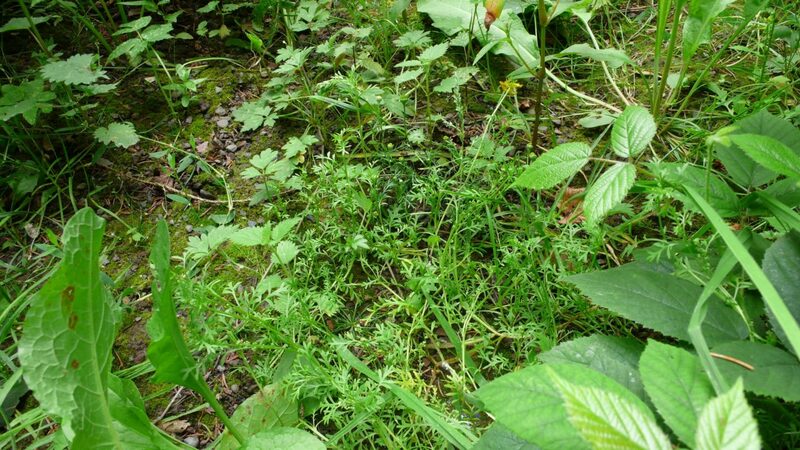 There was also Common Fumitory Fumaria offcinalis, Hedge Mustard Sisymbrium officinale and Long–headed Poppy Papaver dubium. We eventually reached the bridge over the Nith at lunchtime . Here we found an onion in flower with both bulbils and pink flowers present. This is Keeled Garlic Allium carinatum with flat leaves, though these are dried up at flowering, and stamens longer than the tepals (the sepals and petals are reduced to look the same). The ungrazed riverside vegetation was quite tall except on the path and had Yellow Loosestrife Lysimachia vulgaris, Field Geranium Geranium pratense and Wood club-rush Scirpus sylvaticus an infrequently recorded plant along riversides. Greater variety was found on a shingle bank where we saw one of the Monkey Flowers Mimulus guttatus. We were able to compare Marsh Yellowcress Rorippa palustris with petals no longer than the sepals and Creeping Yellow-cress Rorippa sylvestris with petals larger than the sepals and lobed upper stem leaves. We also saw a white flowered crucifer. I initially identified it as Water-cress Nasturtium offinale but when examined under a microscope the seeds had the finer cell detail of Narrow-fruited Water-cress Nasturtium microphyllum . This is only the 6th localised record for this as it has undoubtedly been under recorded and included in records for N .offcinale agg. in the past. We meandered back through the woods to Thornhill which by this time of year are dark and most spring plants missing. We found some late Hedge Garlic Alliaria petiolata. On entering the town we re encountered the issue of where does a garden end when we recorded Italian Toadflax Cymbalaria pallida on a garden wall. This has larger flowers than the commoner Ivy-leaved Toadflax.